Adams Heating and Cooling is the expert for Kalamazoo boilers. Whether you need new boiler installation, boiler maintenance, or boiler repair, Adams has been the trusted source for a quarter of a century. They have the answers to your boiler questions! Boilers use water to heat your home through a process called convection. Many old homes have old boilers with cast iron radiators or base board registers. These homes would benefit greatly from an upgrade to a new boiler because the energy efficiency is much, much better. This can make a very big financial difference for people in the greater Kalamazoo area with old boilers. If you are considering whether a boiler is the right way to heat your home, there are a few advantages to them including the ability to provide In Floor Radiant Heat, and their cost. For instance, they are typically cheaper than a Heat Pump. Another advantage is the ability to zone certain areas. Boiler maintenance includes an annual tune-up in order to check, clean, and verify that there are no water leaks. 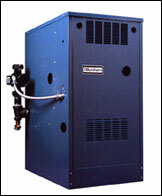 Adams Heating and Cooling sells the complete line of Burnham boilers. They have excellent warranties and efficiency levels. Some models even qualify for rebates up to $1,000.